The Copenhagen bike share bikes we talk about in this article have been on the streets for a few months now. The goal is that each bike is used 3 times a day - by local commuters. So far they are used 0.8 times a day - by tourists. Oops. Fail. These $10,000 shiny toys are already a tourist gimmick - like the originals in Copenhagen - and that does not encourage locals to use them. Locals never want to looks like tourists. Keep reading for more rationality. 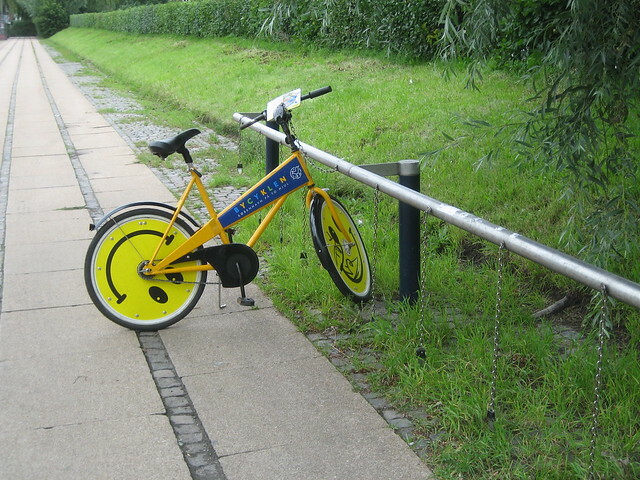 While La Rochelle, France can boast about having started the first proper bike share system in the mid-1970s, Copenhagen introduced the Bycyklen - City Bike - in 1995. Picture above and below, the bikes were cute gimmicks that lasted until late 2012. They worked on a shopping trolley system - put a 10 or 20 kroner coin in and get it back when you return it. The bikes were horrible to ride and it didn't take long for them to become tourist magnets. Most Copenhageners wouldn't touch them with a ten-foot pole. They were, however, visionary in their own quirky way and paved the cycle track for the systems that are now featured in 500 odd cities around the world. And as goofy as they were, I found myself missing them when they were gone. 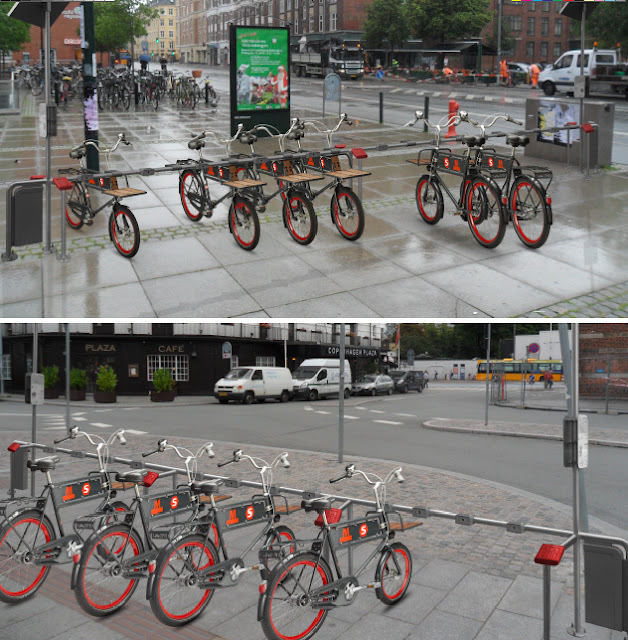 The City of Copenhagen started pondering the idea of getting a Next Generation bike share system back in 2009. We announced the launch of a bike share design competition here on the blog on September 1, 2009. On December 11, 2009, the winners of the competition were announced in Copenhagen. It was never the idea that the winning bike would become the actual bike share bike. The City was just keen to get all sorts of ideas in. The hype soon died out and time dragged on. New politicians showed up who were less bicycle-friendly and the new bike share system idea was down-prioritised. Then the idea got dusted off again and the Danish State Railways (DSB) started taking the lead. A bid went out for concrete proposals. Designs came in. A shortlist was settled upon. Finally, a design was selected. 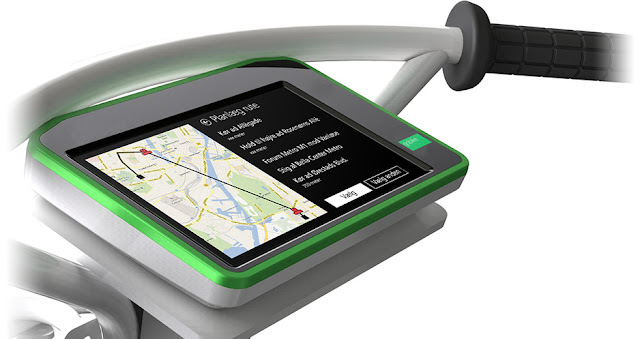 A new system is scheduled to hit the streets of Copenhagen in October 2013. There has been a lot of talk about taking bike share to Generation 3. 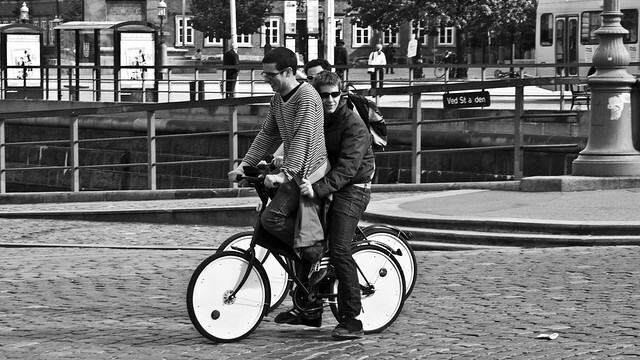 Maintaining Copenhagen's role as an innovation powerhouse regarding bicycle culture. I have a filter about bold declarations from the City but I harboured a secret desire to see Copenhagen select a bicycle design for the new bike share that was something different and something that respected the historical aspects of our bicycle culture. A bicycle that was somehow traditional in its design and far removed from the plastic fantastic bike share systems in other cities. A design that rejects the goofy technological overcomplication our society is riddled with. Something that adhered to the principles of Danish Design. Simple, elegant, functional. There are now 650 cities around the world with bike share systems. The Dutch Railways have had the OV Fiets system at all train station for 10 years, which works brilliantly. So, what will we end up with? Here's the design from Go Bike.dk. Which just looks like a bicycle from UR Bikes, to me, but hey. It's a little, geeky, overcomplicated bundle of tech-solutions, including a tablet screen onto which you punch in your credit card info, as well as look up train times and even gps-based routes to restaurants, cinemas, etc. - Do we really want people unfamiliar to cycling in our city staring at a screen as they ride around? - The tires are solid rubber! 650 bike share systems in the world and we get the one with solid rubber tires - in a city of cobblestones. Unbelievable. - There's a motor. E-bikes are the new scooters. We don't need more scooters. Sending people unfamiliar with e-bikes into a densely-populated city filled with bicycles is just stupid. Read more about the big grain of salt we need for e-bikes here on the blog in the E-Bike Sceptic article. - The price for most bike share bikes in the world is about $800. These bikes are about $10,000 each. Seriously. - Testing a wacky, overcomplicated system in a city where everyone owns bikes is not a clever way to play with taxpayers money. - It's not even free. It costs 20 kroner per hour (about $4.00) (25 kroner if you turn on the e-motor (about $5.00)). You can rent a bicycle for 6 hours at Baisikeli for 60 kroner. - Whoever came up with the idea for a tablet screen obviously doesn't spend much time in the Copenhagen nightlife. It's going to become a game to see how they can be smashed while parked at the stations. You read it here first. In Denmark we have a new public transport travel card called Rejsekortet. A billion kroner was invested in a really crappy solution - similar to London's Oyster Card but just super crappy - in a country where smartphones and debit cards rule. The Oyster Card was used as the inspiration and now it looks like that billion kroner was a waste - travel cards like the Oyster may soon be obsolete. So why the tablet? Useless. The bicycles will also be equipped with an e-motor. First thought? Do we really want people unfamiliar with the city - or locals unfamiliar with e-motors - riding around the city at higher speeds? E-bikes are the new scooters. You don't want to be the new scooters, believe me. People flying along at 25 - 30 km/h in a city where the average speed is 16 km/h. This isn't going to end well. You can read about The E-Bike Sceptic right here on this blog. There's a very good reason that so many Chinese are banning e-bikes. It's called preventing injury and death. The design? Nothing special. Nothing visionary or innovative. Not an interesting symbol for the City of Copenhagen or the City of Cyclists. Clearly inspired by Dutch brand Van Moof. The cost? Over 600 cities around the world have bike share systems with bikes that cost around $800. These bikes will cost around $10,000. Seriously. Complete waste of money for an experiment, especially when you're playing with taxpayer financing. It's not surprising that Copenhagen City Council weren't big fans of the idea when they had to negotiate the budget. The original price that DSB wanted the City to pay was 114 million kroner ($20.7 million) but the politicians whittled that down to a token 40 million kroner ($7.2 million). The remainder went to infrastructure - something people actually need in Copenhagen. The cost of using one of these bikes? In most cities, the first 30 minutes on bike share bikes is free. These new bikes in Copenhagen will cost 20 kroner ($3.60) per hour. 25 kroner ($4.50) if you hit the switch to activate the e-motor. One person involved with the company admitted to us that, at 30 kg, the bikes are almost too heavy to cycle without the motor. You can also get a subscription that will cost you 70 kroner/month ($12.75), but still no free ride like on the rest of the planet. The saturation? 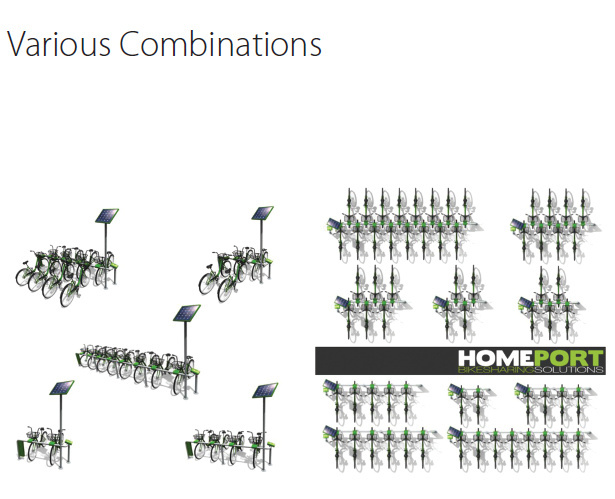 1260 bicycles in 60 stations. Not that impressive. Makes you wonder why the DSB didn't just adopt the Dutch OV Fiets system that the Dutch Railways have going on. An established, successful business model serving the Dutch for a decade so far. If you're incapable of doing anything interesting yourself, then at least copy from people who have experience. While we're on the topic, why not just get an established company who have done bike share in other cities to do the bike share system for you? Save time, money and minimize your risk of screwing up. Especially since we're in uncharted territory with putting in a bike share system in a city where everyone already owns bikes. Yeah, okay. I'm not a fan. Like Socrates said, "Necessity is the Mother of invention." I've ridden almost every bike share bike on the planet, in over 30 cities. There is stuff out there that works. Trying to reinvent the wheel with overcomplication isn't clever, isn't cool, isn't cost-efficient. What makes it worse for me, personally, is that I know that my secret desire for coolness, tradition and style married to functionality in a new Copenhagen bike share system actually exists. One of the designs shortlisted for the bid produced a bicycle that makes me swoon. So what bicycle did we almost get? Sigh. Here it is. 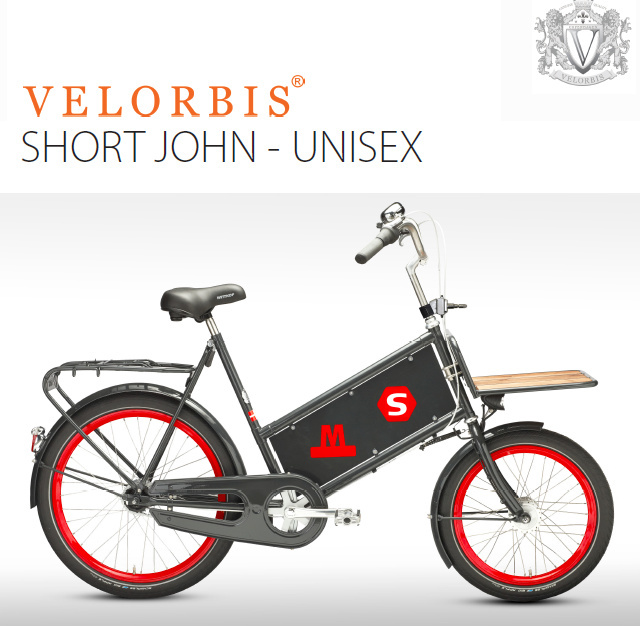 Danish bike brand Velorbis teamed up with HomePort Bikesharing Solutions to produce the bike share bicycle above. 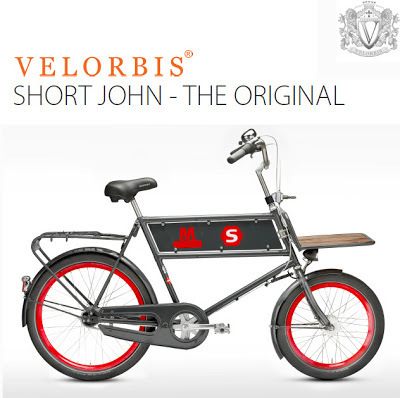 They simply took the iconic Short John (delivery bike) and all its inherent tradition and historical relevance and made it into a bike share bicycle. A bicycle that was the backbone of bicycle deliveries in this city for over half a century. Here's another variation of their design. This is the bicycle I imagined when dreaming of a modern icon for our bicycle culture. They were shortlisted, so I'm assuming that all the tech-specs were in order if they made it that far. The solar panels are a nice touch. I'm not, however, going to bang on about the tech factors and all that. 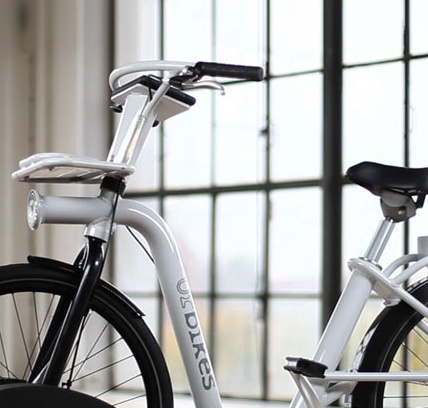 I just lament the fact that we were this close to getting a cool, iconic bicycle that salutes our bicycle history and culture and that still provided a modern bike share system for Danish cities.